The immortal oracle lives at the center of the Dungeon of Trials. Many have tried to reach the oracle for their wisdom, but only few have returned with answers. 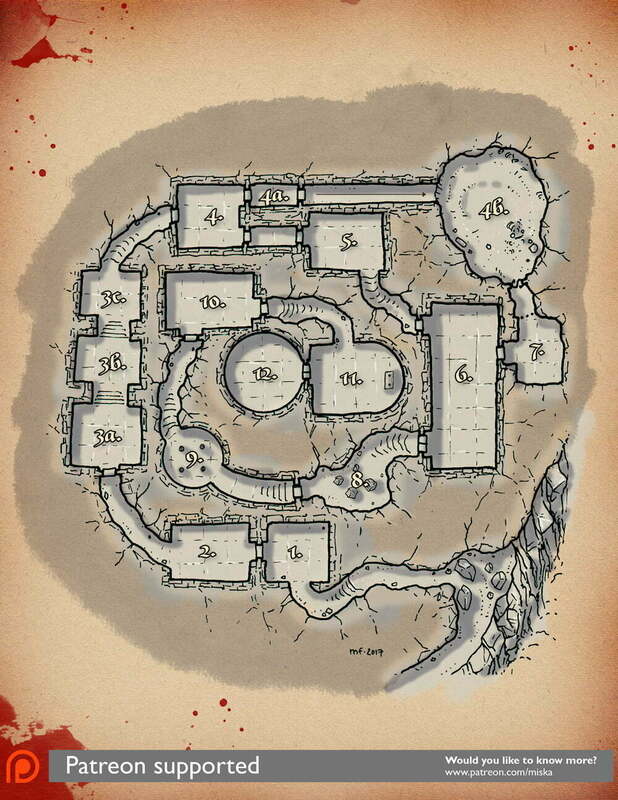 Those who have returned, have told of harrowing visions, terrible traps and unimaginable creatures lurking in the halls and corridors of this spiraling dungeon. For this map I tried to test an alternative for the hatching that I have used previously. Also, I wanted to practice a bit the use of colors. This adds quite a few steps to my normal workflow (i.e. at least doubles the time per map), but I must say that the result is also worth it. For high-resolution and different map versions of this and other of my RPG maps, please, check out my Patreon page and storefronts in DrivethruRPG and RPGnow. This map was originally published on Patreon with the support of my awesome patrons in April 2017.